As Libya's new leadership tightens the noose around the last possible bolt-holes of ousted strongman Moamer Kadhafi and those closest to him, the fugitive would seem to have only two options. Two: to make a break for it across the border with a neighbouring state. Since the fall of his regime last month, no one knows the whereabouts of Kadhafi, who has continued to exhort his backers to resist, while at the same time showering abuse on his adversaries, the former rebels and NATO. Rumours abound: he is in his hometown of Sirte on the Mediterranean coast... in Bani Walid southeast of the capital... in the desert oasis of Sabha, another Kadhafi stronghold in the south... or near the frontier with Niger or Algeria. If he is not flushed out from his hiding place, he may think he can stay on Libyan soil to head the "resistance," as he calls it, or flee into exile. Kadhafi voiced defiance on Thursday in his first address for several days, dismissing as lies reports he had fled to neighbouring Niger. "They have nothing else to resort to apart from psychological warfare and lies," he told Damascus-based Arrai Oruba television by telephone. "They want to weaken our morale. Do not waste time on this weak and ignoble enemy." Most members of Libya's new leadership, the National Transitional Council (NTC), believe the fallen strongman is still on the run inside Libya, but is desperately seeking a way out. Mohammed Zawawi, an NTC spokesman, thinks Kadhafi is in the area along the border with Niger, but that he cannot stay there for much longer. "He can't stay in Libya. He's finished," Zawawi told AFP. "The only thing he can do now is head for an African nation willing to take him in." There are still pockets along the frontier that are not controlled by NTC forces in the vast north African country, which is 90 percent desert, and Kadhafi can still count on support among Tuareg former rebels. If he is indeed still inside Libya, he may be waiting for the right moment to make a dash across the border, according to one official in the frontier region with Niger who spoke on condition of anonymity. The official, from the Toubou ethnic group, said Kadhafi's most likely route to safety in Niger would be through the remote Algerian desert from the southern oasis town of Ghat on the border. And Niger on Thursday did not rule out welcoming Kadhafi. "We hear all kinds of rumours everywhere... Some say that he is in Burkina and others that he's in Niger but that is not the case as of now," Nigerien Prime Minister Brigi Rafini said after meeting Burkina Faso's President Blaise Compaore. "At least for now, we have not given him shelter," Rafini said. 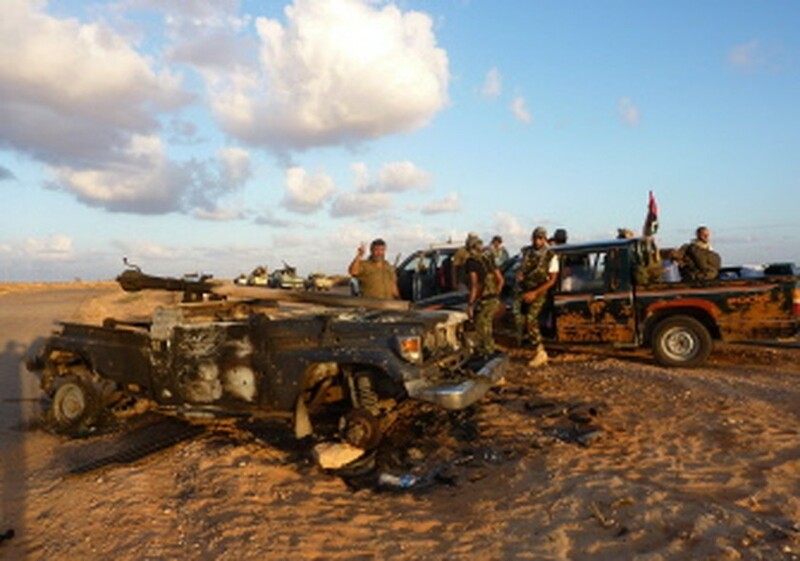 At least two convoys of Libyan vehicles have entered Niger in recent days, sparking intense speculation that Kadhafi was en route to either Niamey or Ouagadougou. Both west African countries have been major beneficiaries of Kadhafi's largesse in the past and tipped as potential destinations for the fallen leader and his entourage. Fathi Baja, head of the NTC's political affairs committee, believes Kadhafi "is very near the borders with Algeria or Niger" -- and desperate. "Kadhafi is looking for somewhere to hide, anywhere he can go with his family," Baja told reporters. A fleeing Kadhafi and others wanted by the International Criminal Court (ICC) puts several African nations in a potentially embarrassing position. South Africa has criticised the NATO campaign in Libya and still backs the African Union "roadmap" calling for a transitional government that would include representatives of Kadhafi loyalists. Pretoria has repeatedly denied reports that South Africa was working on a deal to offer Kadhafi safe passage to a third country, maybe Venezuela, and as a signatory to the ICC it cannot accept him. Wherever Kadhafi is, the Toubou official believes his "nuisance factor remains high, and he's a danger to all neighbouring states" and would use his contacts, weaponry and cash to wreak revenge on those who ousted him. "Our information shows he is setting up a 'front' in border regions in the west, in collaboration with Al-Qaeda in the Islamic Maghreb and every other extremist group he can find," the official said. Such claims are impossible to verify independently. "Nothing can be ruled out, but I strongly doubt he could do that inside Libya," Zawawi said of the Al-Qaeda theory. "But abroad, he could finance terror groups to cause problems and destabilise" the region. The NTC and the United States have urged Libya's neighbours to close their frontiers to Kadhafi stalwarts. And human rights group Amnesty International said on Thursday Libya's neighbours must arrest Kadhafi and others on the ICC wanted list if they cross the borders.